After nearly two years of waiting, Valve has finally lifted the curtain on the final version of the Steam Controller. With one-to-one positioning, the controller can "virtualize familiar controls, like a trackball, a mouse, or a scroll wheel," providing a degree of precision that controllers generally aren't known for, according to Valve. The triggers are dual-stage, with a digital switch at the end of an analog pull, and there are also grip buttons, so your ring and pinkie fingers can get in on the fun too. 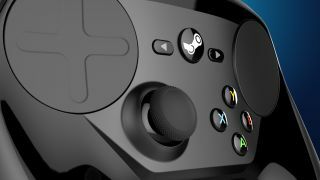 Typing with the controller in Steam Big Picture has been made less of a hassle, says Valve, and control setups can be customized on a per-game basis. We tried the new version at GDC 2015 and it certainly felt like an improvement over the prototype Evan tried last year. Some controllers will ship early in October, and it sounds like the rest will start going out sometime in November or December. "A limited quantity of orders will be shipped October 16th, weeks in advance of our official launch," Valve wrote. "Pre-order now and be among Steam Hardware’s first wave of users." You can get a closer look at the Steam Controller on its store page, where pre-purchases are available for $50/£40 in the US and UK. They don't seem to be available for purchase through Steam in Canada or Australia yet. The Steam Link, a device for streaming games from your PC to your TV over your home network, is also on sale for the same price.